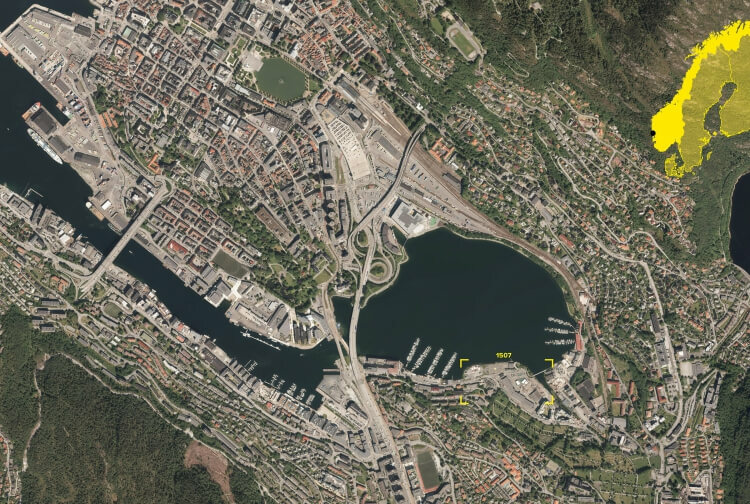 The idea of a ‘Bergen Storsentrum’, an extended city centre, would unlock pockets of densification and differentiation allowing growth and consolidation of the centre for a widespread city. Three distinct areas emerge with the historical centre, the mountainside residence and the industrial shoreline. This fringe along the water is changing greatly since it is a cultural landfill and a privatized grey zone. It constitutes for Bergen the last and biggest land bank of this central zone, a unique chance to bring civic life back to the sea. Today however there is not yet a large coherent vision with an ambition to speculate here on dense and forward-looking urban form. Homogeneous at first glance, this waterfront holds several different yet interconnected neighborhoods or ‘‘islands’’. This gives us a chance to both unify and differentiate such a large district. It also helps us establish a critical thinking addressing the opportunistic development in this area. ‘’Høyøya’’ represents this overall architectural vision establishing a holistic approach to a new urban culture for ‘Bergen Storsentrum’. This is not a new idea when witnessing local actors developing those territories and our proposal recognizes this but takes a crucial curating role, with architecture as language and tool. To engage key actors around the design of a coherent and ambitious extended centre, we look at the entire district with meaningful layers including ‘’Høyøya’’ and Møllendal West. It is an unprecedented compilation of drawing that argue for a collaborative process toward an adaptable but robust proposal. With a resilient neo-rural movement driving a return to the affordable, green, and fiber-optic connected countryside, can the city provide a qualified alternative? This scheme addresses the question of how successful family living can be sustained on a complex, urban location. The courtyard buildings with varying heights balance the need for acoustic near the road, visual privacy in an optimal sun condition. This creates a variety of visual engagement with the protected communal areas inside and exterior views. At the ground level, the placement of buildings shapes pedestrian movement and allows visual permeability. The warehouse welcomes the new kinder garden with a local food market and is visible from the park through the central plaza. The residential communal life is organized around a sequence of inter-connected collective spaces that range from courtyards and roof terraces to outdoor corridor, and private gardens. This allows for a range of experience ranking from gardening like in Nordnes, to breathtaking metropolitan terrace view. As the cost of housing and construction prices soar, affordability, waste management, regional production and adaptability must drive the strategy and deal with the contemporary difficulties to live in qualitative long-lasting urban environment. We envisage a system that can be either built onsite or prefabricated as modules but driven by the same commitment to propose a flexible solution. The typologies are designed to be adaptable so that the family can spend a lifetime in them. Transformation in time is possible by converting balcony to bedroom back to winter garden for growing and shrinking modern families. Repetition for diversity.